An instant Cycle Chic classic? A billowy, dreamy rush of red and pink as she casually checks her nails, heading home in the afternoon. 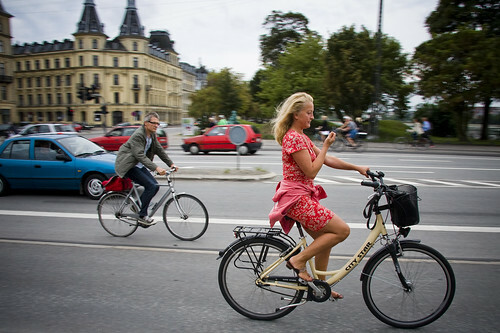 Easily competing with the twentysomething Copenhagen fashionistas on bikes in style and grace, with the added feminine arsenal of experience and self-confidence that comes with age. Good thing the bicycle lanes are double width on this stretch, as sometimes such visions are best viewed from a slight distance, as the chap may attest. Get too close and she may disappear, leaving you wondering if she ever existed at all. wow i love this one. she has a 'resonance'..
Stop being so youth oriented. Those kids get enough attention already. I want to nominate my Baksfiets for consideration. I know the Baks does not have the grace of some of the bikes you have shown but it's a wonderful ladies bike because it can carry my little expressions of femininity – my children. I have never felt more feminine than when I have had my two little ones in the front cargo box and my baby strapped into her seat on the back with the wind streaming my long dark hair behind me, my dress hitched up high on my muscular biking thighs. Love my Mama Fiets. I am looking for someone playing the ukulele while riding a bike. Have you ever seen someone playing an instrument while riding? Keep your eyes open and your camera ready. I have seen one guy playing the harmonica, coming down Jernbanegade.